What if Jesus Could Teach Your Kids? HE CAN...THROUGH YOU! Jesus was the master at using creative objects—like coins, fish, and lilies—to connect eternal truths to everyday life. With Hands-On Bible Curriculum, kids experience the same powerful connections between Scripture and everyday life by engaging all five of their senses. The Bible comes alive with this Group Sunday School curriculum! Kids understand God's Word, love it, and remember it for a lifetime. Hands-On Bible Curriculum is a quarterly, age-graded curriculum for toddlers through 6th graders. The two-year scope & sequence guides kids through the Bible, as they learn and understand biblical truths and develop a deeper, thriving relationship with Jesus. What’s a gizmo, you might ask? Gizmos are fun, interesting objects that help kids discover God’s truths in unforgettable ways. They help kids retain 90% of what they’re taught! Kids will remember what they learned weeks, months, and years later because they truly experienced the lesson! Kids don't just hear God's Word - They experience it! In addition to gizmos, you’ll use unique games, snacks, and crafts to help kids learn about God. Kids retain more by interacting with a lesson instead of just hearing it. Discovering the Bible will be a fun, hands-on experience that gets kids excited about Sunday school. Engaging activities get kids' attention from the moment they arrive! Age-appropriate welcoming activities create a hands-on learning environment as soon as they walk in the door. Intriguing gizmos and active learning experiences help drive home the Bible Point. Simple activities for preschoolers and more challenging lessons for elementary ages meet kids where they are in their spiritual and cognitive development. Each age level has a life-application "Live It!" activity and reproducible take-home pages to reinforce what the kids have learned and help them apply it to their daily lives. Powerful music, audio dramas, and sound effects deepen the emotional impact of lessons for toddlers through elementary age levels of Hands-On Bible Curriculum. Listen to samples below. 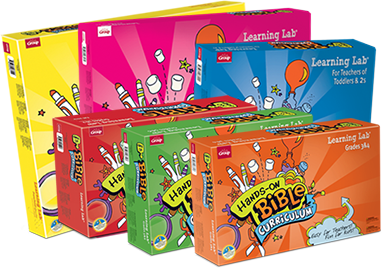 Hands-On Bible Curriculum requires a Learning Lab for each age-graded classroom. Each Learning Lab includes one Teacher Guide (with activation code for free digital copies) and all the gizmos, music CDs, and special supplies for each lesson’s hands-on activities. Other basic classroom supplies are needed but not included. Additional Teacher Guides and music and sound effect CDs are also available for purchase. Everything you need to get started with Hands-On Bible...includes kid-tested Bible Discovery Paks, lively gizmos, a music and sound effects CD, and unique sensory teaching tools. Additional Resources Add as many Teacher Guides (sold separately) and Multimedia CD's as you need for each classroom.